This is a photograph of George Washington Sloan, Hannah Jane McCullough Sloan, and their children. 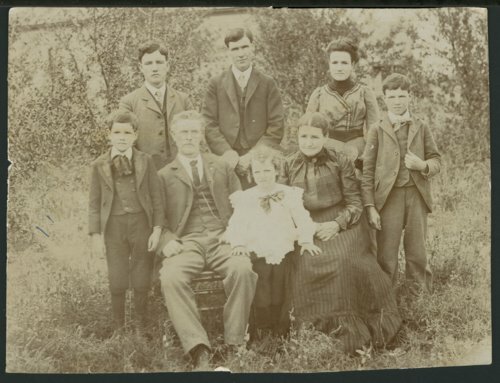 People in the photograph are identified as (left to right) back row, Edward Ray (born 1883), William James (born 1880), Nellie Blanch, front row Floyd (born 1893), George Washington Sloan (born 1850), Harry (born 1896), Hannah Jane McCullough (born 1856) and Howard (born 1887). The family came to Kansas in 1886 and settled in Sheridan County.